Food poisoning—made for a miserable long night and a late start today. Breakfast was a handful of pretzels and a bottle of juice for Glen and a boiled egg with toast and coffee for me. 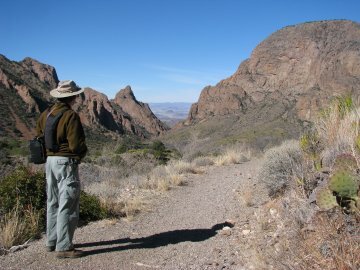 We had planned to do one hike in the morning and another in the afternoon with lunch at the Chisos Lodge. Our plans were scaled back to just Window Rock, a hike we’d never done before. Mountain lion and bear sightings were noted in the visitor center; Glen recalled stealing baby black bear cubs in his younger years while at Honey Rock in northern Wisconsin. Gallantly, Glen led the way down the path so as to provide a distraction for the mountain lions that had been sighted at the beginning of the trail. I carefully selected a rock for my pocket and looked behind us frequently so as to keep an eye out for black bears. Signs posted along the way warned us to wave our hands, to store any smelly food in our vehicles and to not lag behind or stoop down. The path was down hill, through a lot of switchbacks and steps. Our return was guaranteed to be worth several workout sessions at the gym. It was a bit chilly, particularly through some of the rocky overhangs and I stopped to put a bandanna over my ears. Several hikers were on the path, most carried binoculars and walking sticks. One had a very long lens on his camera; most commented that there were a lot of birds but no wildlife sightings. We noticed skat along the way but were careful to not step in it. Rustlings in the underbrush were frequent and I spied what I think was a javelina running away from me—thank goodness, as I needed to reserve that rock in my pocket for the mountain lion. I experimented with taking several color swap photos. Glen took several photos of the two of us using the large rocks as a makeshift tripod. The view from Window Rock was well worth the trip; it is absolutely gorgeous. The rocks are worn smooth and I slid down the last small section. Glen stood well back, still suffering from agoraphobia and took photos. Choosing the correct exposure for a dark canyon looking over a sunlit valley is challenging. The return was even more demanding than I expected. The sun was warm and I took off my jacket and sweater and removed the bandanna from my ears. Both knees were complaining as well as my hip and back by the time we reached the visitor center. It was now about 4 in the afternoon, too late for further explorations even if my knees had been up to the task. We drove out of the park to Study Butte, stopped at a little grocery store to pick up sandwich makings and some milk for tomorrow’s breakfast. Tonight, I’ll sort out photos, label them, and rest my weary bones.